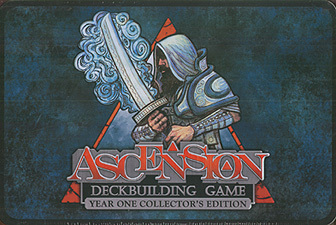 Enjoy the award-winning sets released in Ascension's initial year with the Year One Collector's Edition! Gather your Heroes and Constructs to fight the fallen god Samael and his minions in style - all 346 cards feature updated card frames in a premium foil finish! Beautiful cards and premium components make this the perfect centrepiece for your Ascension collection. Includes Ascension: Deckbuilding Game, Ascension: Return of the Fallen, Rat King Theme Pack, Rat Queen Theme Pack, Leprechaun Theme Pack, Samael Claus Theme Pack and the entire first year of promo cards! Playable as a stand-alone 1-6 player game, and completely compatible with other Ascension expansions.